When it comes to pressure cookers, despite all its advantages the traditional designs are just not perfect for the modern fast lifestyle. While not many manufacturers have found a solution to this problem, some of them have and Nesco American Harvest is a classic example of the same. This is a multifunctional digital pressure cooker that can serve you in more ways than one. One of the best things about using digital technology with domestic appliance is the smartness and intelligence that can be programmed into these inanimate things. The Nesco American Harvest cooker can be operated in warm mode, browning mode, slow-cook mode or steam mode. The digital timer allows you to delay the cooking of the food. You can set the timer upto 8 hours allowing you to come home after office and find food ready for dinner. The Nesco American Harvest is really three cookers merged into one. You have the pressure cooker for the rapid cooking needs, the steamer for cooking delicate foods like vegetables and the slow cooker for making those tasty dishes that need long hours of cooking. 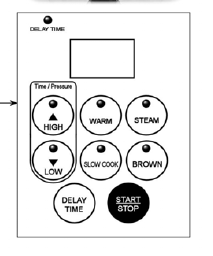 The pressure cooker has two pressure settings for cooking wide range foods. When these cooking features are combined with the fabulous digital controls you are looking at a truly versatile and smart pressure cooker that will meet all your cooking needs. The Nesco Professional 3 in 1 Digital Electric Pressure Cooker is not just about the modern hi-fi digital controls but also some solid design and engineering. It comes with a steaming rack to cook vegetables and pasta. The glass cover is perfect for browning mode. The external brushed steel design makes it very attractive to look at. This unit can easily fit into any kitchen setting. The compact 12” X 12” X 18” size means it will not occupy a lot of counter space given the convenience it can deliver. The inner cooking chamber is removable and comes with non-stick coating. This allows you to cook all kinds of foods and still clean the unit easily. The unit also have a stay-cool lid which ensures you never get burnt fingers when you are opening the cooker after cooking the food. The safety steam release feature ensures that the lid cannot be opened till pressure inside the cooker falls to normal levels. Of course, when you get a product this versatile and this intelligent, it is hard not to love it. The customer reviews on this product reflect how good this really is. The people who have got this to work for them have nothing but great words regarding the efficiency and convenience this unit offers them. However, the people who have run into problems with their purchases have been disappointed with the after sales service from the dealers and the company in general. The bottom line is if your product works, this is the best thing you can add to your kitchen, however, if you run into problems you could have a tough time getting it fixed. 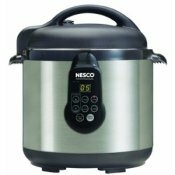 How to guides on Nesco pressure cooker can be found here. You can have some guidelines for troubleshooting, how to clean, hints and tips and many more.